So my blogging attempts have been abysmal lately, which is pretty obvious if you look at my three week gap between posts. Recently I haven’t been happy with how my projects are going, or my attempts at writing, or the videos i’ve tried to edit. The combination of all those things going poorly has led to a bit of a motivation block, where I don’t feel like working on anything. But i’m trying to fix that! And i’m also going to attempt to follow a blogging schedule, and a schedule in general since I’m a lot more productive when i’m following lists and trying to reach weekly goals. Part of my plan to restore my enthusiasm involves starting new projects. And this is one of those new projects. I normally I write about projects after finishing them but today I felt like posting about what i’m currently working on for a change! For a while now i’ve been itching to make something different from my recent projects. Something where the construction is the main focus. Which is why I decided to make a plaid skirt and jacket with every seam matching perfectly to create a chevron print. What is more construction focused than that? 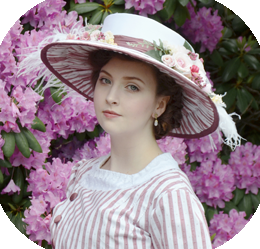 It’s based off this ensemble, which is one of my favorite examples of fashion from the 1890s. I’m not trying to recreate it, just using the shape and pattern as inspiration for my own piece. Right now I have no clue what the jacket I plan on making for this project will look like, but I have made good progress on the skirt, which is what this post is about! For this project i’m using the fake wool that I purchased from Joanns a while back. I have a little more than six yards of this and it was purchased for a total of $24. I’m pairing it with two yards of a silk I purchased a few years ago, which I’m pretty sure cost $16 total. I think including the price of lining materials and basic supplies this project will have a total cost of $50, which is pretty good for a historical ensemble! The first step was creating a pattern. Or taking the measurements to create a pattern. I would have liked to cut the skirt as two pieces, with two seams, but I didn’t have enough material for that. So instead I came up with a six piece pattern with shorter side panels that would have the lower portions pleated. 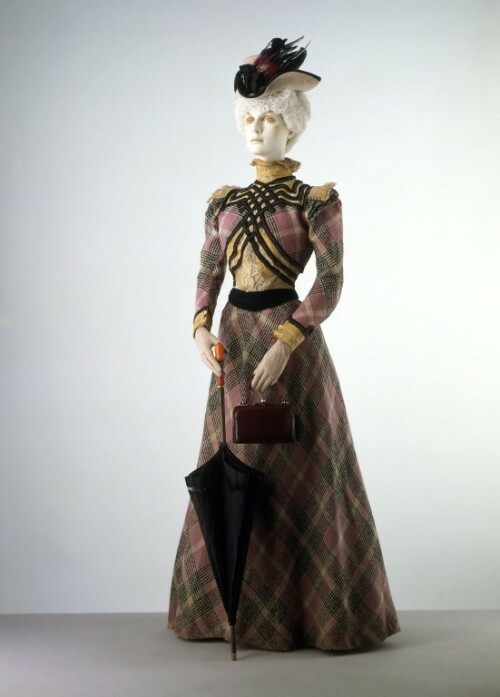 I’ve seen similar things done on lots of dresses from the 1890s and I thought it would help break up overwhelming amount of plaid. I turned the measurements into a functional pattern then started laying it out. Each panel has to be bias cut to create the chevron print. Unfortunately this process requires a HUGE amount of fabric and leaves lots of weirdly shaped scraps. I’m really hoping those weirdly shaped scraps can be used for the jacket, otherwise I may not have enough material to complete it! To make sure everything was cut out on the right angle I drew guidelines onto my pattern pieces. These guidelines were matched up with the underside of a beige line. Here are two of the pattern pieces laid out. I used the pattern for cutting out half the skirt, then used the pieces I cut out as a guide for cutting out the other half. This way I could perfectly line up each piece with the fabrics pattern and ensure that my skirt would be symmetrical and that my seams would match up. You know you’ve done a good job when it’s difficult to see the piece that’s already cut out because it blends in so well. And if everything is done properly the pattern should match pretty well without *too* much effort! Here are the two front panels before I sewed them together. Though the pieces line up pretty well, I wanted them to line up perfectly after they were sewn. So I didn’t use pins for this project at all, instead I basted all the pieces together by hand. For each seam the process was the same. I started by basting the pieces together with wrong sides of the fabric facing each other. I used the plaid pattern as a guide and made sure my needle went through the same points of the pattern on each side. This was made a bit more challenging by the fact that everything was cut on the fabrics bias, so it shifted around and warped really easily. Then I used my machine to straight stitch over the basting stitches. I trimmed the seam allowance down to an eight of an inch and pressed the seam open so it was flat. Then the fabric gets folded at that seam line, with the right sides of the fabric facing each other. And then the basting process gets repeated! Then I used my machine to sew over the basting stitches and ironed it once again. This is the front seam, so the primary and secondary pattern both line up. Unfortunately I didn’t have enough fabric to make all the panels line up this well. The pattern on the side panels only line up in one direction – note how the lighter beige stripes and light grey boxes don’t line up. Luckily this really isn’t noticeable from a distance, since the zig zag pattern is so much more prominent. Speaking of the side panels, somewhere along the way I majorly goofed up. After spending hours making sure everything lined up perfectly and getting half the skirt sewn together I realized I cut the back of the skirt out upside down. So the plaid was facing in the wrong direction. It looks fine from the front! My dad kindly drove me to the two nearest Jo-anns but neither of them had any more of this fabric. I didn’t have enough fabric left to recut the back panels, so I decided to add a second side panel instead. Not ideal, but better than nothing. I sewed together the two side panels using the same hand basting method. The I turned the hem inward by a half inch and created a facing out of some brown suiting. Most skirts during this period had facings at the hems, or were lined. This added weight to the hems which make the skirts easier to walk in, and makes the skirts lay better against the petticoats. I sewed the facing in by hand, then made up some piping. For this I used cotton cord and some green wool that was leftover from my Merida costume. This also got sewn on by hand. Now it was time for the pleated panels! I cut out two twenty eight inch by forty eight inch panels of silk. Then I turned the hem inward by a half inch, twice, and sewed the hem by hand. And then both panels got knife pleated. I went for one inch knife pleats, which are half an inch deep since I didn’t have enough material for the full depth. I pinned the pleated panel on roughly, then pinned it to my dress form and adjusted it so the length was right. Then it got pinned on properly and sewn on with a whip stitch. Here is the back of the pleated panels after sewing them on. As you can see there is some excess fabric at the top, which I trimmed down to one inch. Then I folded the trimmed edge inward, so the raw edge was hidden. And then I sewed the edge down. Now the interior of the side panels looked like this. And the outside looked like this. And that’s my progress on this so far! I really like how it is coming along. I still have to do up the rest of the skirt seams, hem the front and back panels, add facings, and sew hooks into the back. So it isn’t close to being finished yet, but it’s getting there. Oh, I should probably also mention that the sloped hem on the side panels is intentional. I thought that would make it look a little bit more interesting, though for some reason I didn’t include that detail in my pattern sketch. Just beautiful! I can’t wait to see what you dream up for the rest of this. Looks like an awesome start! Can’t wait to see the finished project! When you purchase your fabrics keep a small notebook with a snip of fabric, store it was purchased at and the sku# from the receipt. That way you can call and have other stores checked for the fabric. Would probably need to pay shipping but it might be worth it to complete the project the way you wanted it. Lovely color combo’s! Loving this project so far! You have to be brave and patient to tackle plaids. Good for you. Having such a nice evening between catching up on your YouTube videos and also here on your blog posts. I wish I had an unlimited budget and could offer to copy my fragile copies of 1890’s garment catalog illustrations. But then, with the internet now you probably have access to much more than I did as a young seamstress back in the Dark Ages. lol I am wondering if you will do the 1890’s thing of adding miles and miles of ruched trim to your garment?